Recognize great achievements with our custom recognition pins. All pin processes are available, including precious metals and gemstones. Please refer to the specific manufacturing process for pricing. To signify achievement levels, use varying colors of gemstones or enamel, engraved numbers, tabs and bars, or differing finishes. 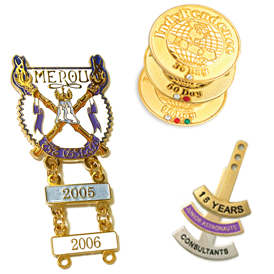 For pricing on custom recognition pins, tabs, and hangers refer to the specific manufacturing process you require or call for assistance.